According to research, high protein diets with moderate carbohydrate intakes along with exercise have shown to enhance fat loss while promoting muscle retention. 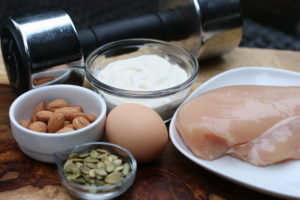 Excellent sources of protein include lean meats, poultry, fish, yogurt, eggs, fermented soy (i.e. tempeh), nuts, and seeds. Consume low glycemic carbohydrates high in fiber in order to prevent blood sugar and insulin spikes (a hormone that promotes fat storage). Examples include unrefined whole grains, vegetables, and fruits. Also, don’t forget to consume high quality sources of fat including fatty fish rich in omega-3, avocados, olive oil, coconut oil, nuts and seeds. Abete, I., Astrup, A., Martinez, J. A., Thorsdottir, I., & Zulet, M. A. (2010). Obesity and the metabolic syndrome: Role of different dietary macronutrient distribution patterns and specific nutritional components on weight loss and maintenance. Nutrition Reviews, 68, 214–231. Phillips S.M. & Van Loon L.J.C. (2011). Dietary protein for athletes: from requirements to optimum adaptation. Journal of Sports Sciences, 29(1), S29-S38.